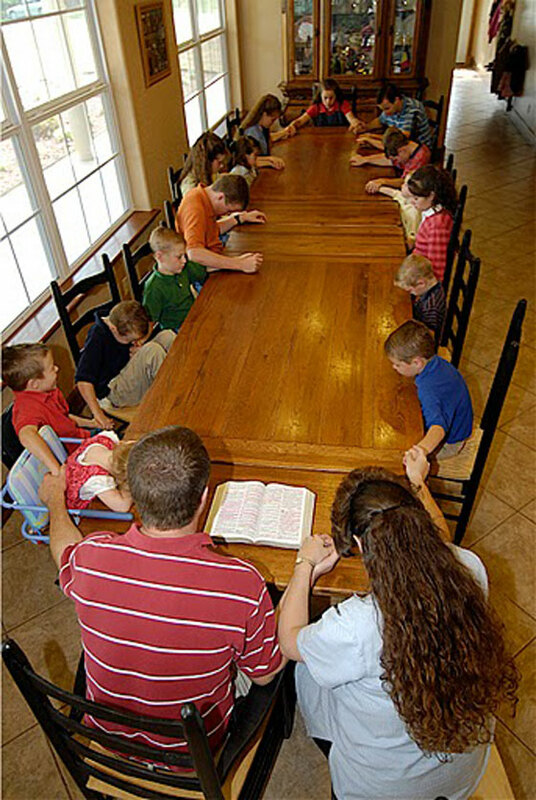 Around the Duggar family table. Those who pray together, stay together! I love the Duggars. God whispered in my ear to home school, but it was through the Duggar’s example that we live our lives the way we do now. I knew that our lifestyle was not working for us, that we were very unfulfilled and unhappy, but I didn’t know there was this whole other way to live. Watching them really opened my eyes and made me seek out this type of lifestyle. Our modern culture just does not teach us to live exclusively for Christ. Even our modern churches do not teach this. The way of the modern United States is to go to church on Sundays (most of Americans don’t even do that anymore! ), try your best to follow the Bible (most Christians have not even read the Bible), and that God is a forgiving God and He will understand that we are human (which basically gives all Christians a free pass to behave the way they want to behave….NOT the way God wants us to behave). As for our children, public school is just accepted as the place to put your children when they turn five. If you can afford it, you can put them in Christian private school. Most (but not all) parents who can swing this option feel almost self-righteous about their decision, as if they are much better Christian parents because they send their kids to a Christian school. The fact is, they are still sending their kids off to be taught by someone else. The Bible says: And thou shalt love the LORD thy God with all thine heart, and with all thy soul, and with all thy might. And these words, which I command thee this day, shall be in thine heart: And thou shalt teach them diligently unto thy children, and shalt talk of them when thou sittest in thine house, and when thou walkest by the way, and when thou liest down, and when thou risest up. Deuteronomy 6:5-7. Now, there are parents out there who have to work, and therefore must send their children to school. I am not here to judge someone’s views on public school or private school…..everyone must do what they feel is right. However, this Bible verse is in black and white. If you are a Christian, you must (whether it is PC, or you like it or not, or whether your mother agrees with it, etc.) 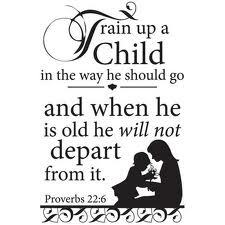 take it as God talking to you directly about how to teach yourself and your child. Now, if you send your kids out of your home for someone else to teach them, no problem, that is not really the issue. The question you have to ask yourself is this: “Are YOU teaching them diligently about God when you are sitting in your house, as you are walking to and fro with your busy life, when you are lying down, and when you are getting up? God does not say, “Well, as long as they learn about Me in Bible class at the Christian school or in Sunday School, than that’s enough”. Um….no. He is telling YOU to do it. “And Thou (meaning you) shalt teach them (meaning your kids) diligently (faithfully, not just a blessing over a meal) unto thy children (again, meaning your kids). That’s pretty powerful stuff. Now, please hear my heart. I sent my kids to public school. My husband and I were reaching for that brass ring, both working, sending both of our children out into the world hoping that others could do a good job teaching them the things we ourselves should have been teaching them. It was more important that our kids get good grades and do well in sports than to read the Bible and have daily family devotions. A little bit of the problem was family traditions. The only praying we did as a family was the blessing. A little bit of the problem was the world around us. No one that I knew did family prayer time, read the Bible on a regular basis, etc. The rest of the problem was bad management of time. We always said that we would get together as a family and read the Bible and pray, however, so many other things got in the way. I realize now that being ‘busy’ is the Devil’s way of keeping us from God. We made the ultimate decision to home school our children. We feel that teaching our children ourselves keeps us closer as a family, we can instill values that get contradicted in the school setting, and we can teach things that are truly valuable…..God’s Word. You may feel that the public or private school setting is the only way you would possibly educate your children. To each his own, that is the beauty of an opinion! Just remember, when Jesus Christ comes calling for us, He will not care if we have a great worldly education, but He will care that we have immersed ourselves in His Word and did our best to be servants like Him. So, no matter how you chose to educate your precious gifts from God, make sure that you take the time to educate them about His Word. How much time? Well, let’s see……..how about when your sitting, when your walking, when your lying down and when your rising up?